Who says you can't sell a book by its cover? Ask anyone who has browsed the shelves in a bookstore. American publishers have used many gimmicks to try to get you to buy their books, including startling shapes, outlandish typography, and peekaboo dust-jackets. More than 140 strange and wonderful 20th-century American books are currently on display in the Rotunda of the University of Virginia (UVa). Among the books on show are "The Hairy Book," bound in black hair, and "Miniature Golf," bound in Astroturf. "Platespeak" has aluminum covers shaped to look like an automobile license plate. "Bridges" is seven inches tall by nearly two feet wide. 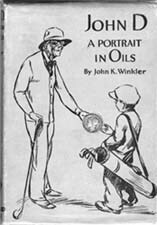 "John D.: A Portrait in Oils" shows John D. Rockefeller presenting an actual dime (embedded in the book's front cover) to his golf caddie. Some of the exhibition's books have inserts; "Love Letters" includes envelopes with real letters inside. "Secrets of the Deep" contains water windows which you can squeeze to make the cardboard fish swim. "Mystery in Bugtown" features plastic eyeballs with moveable eyes. "Hey Diddle Diddle" has a built-in rattle (not a good idea, as the publisher discovered when babies began eating through the binding of the book and swallowing the rattle pellets). There are do-it-yourself books in the show. "The Paper Shoe Book" turns into a pair of shoes. "Build Your Own Guillotine" contains cut-outs with instructions for making a miniature guillotine and tumbril. Some books take the physical shape of their subjects. "Oil Painting: Materials and Methods" is die-cut to resemble an artist's palette. The irregular shape of "Ferrington Guitars" accommodates pictures of the music instruments the book describes. A number of books on display have variant dust-jackets. Some dustjackets on General Norman Schwarzkopf's 1992 autobiography, "It Doesn't Take a Hero," show the left side of the author's face. The rest show the right side. Put two copies of the book next to each other, and you get Schwarzkopf's whole face. Some of the books have tongue-in-cheek subjects: "Teach Your Cat to Read" comes with elementary and advanced readers and a cat dish/book stand. "Lady Cottington's Pressed Fairy Book" shows you how to preserve pixies. This unusual exhibition was put together by UVa undergraduate Darby Kimball '99, from Aiken, South Carolina. A third-year student majoring in mechanical engineering, she is a Rodman Scholar at UVa. "The books in the show help explain why people like go to bookstores," Kimball says. "How many of us can go into a bookstore and pick out exactly the book we came in for and then pay for it and leave without at least picking up or touching other books, as well?" In order to find books for the exhibition, Kimball telephoned publishers all over the country and asked them to tell her about some of their more unusual titles. Kimball developed the idea for the exhibition in an undergraduate history seminar taught by Terry Belanger, University Professor and Honorary Curator of Special Collections at UVa. "It's very rare indeed for an undergraduate to do a large exhibition like this one," says Belanger. "They're a lot of work. Darby Kimball deserves a lot of credit for seeing the show through." "You CAN Sell a Book by Its Cover" is on display in the Dome Room of the Rotunda at UVa, the centerpiece building on the University's historic Grounds. The show will be up through February 6, 1999. The Rotunda is open daily from 9 to 4:45 pm (except during Christmas break at the University, December 22 - January 15th).